Lace Infinity Pattern Scarves. 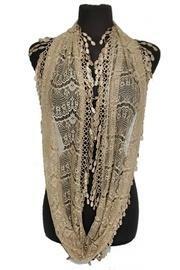 Chandelier Tear Drop Lace Infinity Pattern Scarves. Fashion Clothing & Accessories. Approx 14 wide without the tear drops. 6 ways to wear. Basic scarf. Scarf with hood. Doubled scarf with hood. Doubled scarf. High neck double loop. Shrug. Premium fashionable infinity scarf. Soft material.